After the success of its crowdfunding partner on KickStarter in 2014, FarmBot.io returns at the end of the year with a much new and much larger version of its FarmBot. If you discover FarmBot, it’s an open source project that aims to robotise (respectfully!) Domestic agricultural production. Farmbot is nothing but an XY table on which a tool carriage (Z axis) is installed. The tool carrier and accessories originally manufactured in 3D printing are now manufactured by more conventional methods of plastic injection. The tool holder makes it possible to sow the seeds, to water and to eliminate (to push in the ground quite simply) the weeds. Weeds are identified by image analysis using an on-board camera. Watering is automatic. It takes into account the degree of soil moisture and the weather forecast to save water. 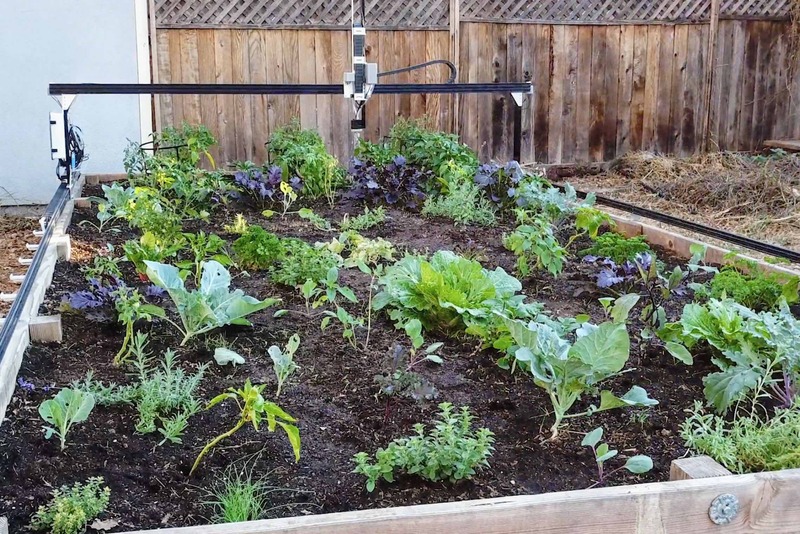 A Web App allows you to organize your garden from a tablet or smartphone. To better understand the possibilities of the project, here is a short introductory video. 2 Plant your vegetables from your couch! You are certainly wondering why to present this project on the blog. Well simply because FarmBot uses the same components that we use in our projects! The Farmduino board based on an Arduino Mega 2560 allows you to drive the Nema17 stepper motors, the electro-irrigation valve and recover the measurements of the probes (temperature, soil moisture …). The firmware is a G-Code command interpreter. The source codes of the different components are available on GitHub. This is a very good example of learning. Firmware to install on the Arduino Mega 2560. It was developed with Eclipse Arduino v2. In a new development environment to discover! The list of material is here. ABS parts are now produced in plastic injection. However, you can print them in 3D using ABS filament. Digital models are available here. They were drawn using Onshape. A free account is required to retrieve digital models. Links to STL files are not yet available. Plant your vegetables from your couch! The strength of the project is undoubtedly its very intuitive management software that allows you to organize your garden and follow the growth of plants from your couch. The Genesis XL model has a planting area of 2.9mx5.9m (instead of 1.4m x 2.9m for the Genesis model). The kit is available for pre-order priced at $3295 instead of $4095 from January 2018. This is a nice Christmas present! The Genesis is still available for sale at a price of $2395 instead of $2595 throughout the month of December. Given its price, this project is aimed primarily at wealthy Makers. Since the project is entirely open source, the more do-it-yourselfers will be able to embark on the adventure.